I have a cousin working in Paricha Thermal Power Plant, near Jhansi in Uttar Pradesh. I had been planning to visit him for a long time and could finally getaway last weekend (5th & 6th March 2011) and it turned out to be a perfect weekend hideout! It takes about 6 hours from Delhi to reach Jhansi by train and there are umpteen number of trains to suit all times during the day. I took a night train on Friday night and reached Jhansi early morning on Saturday. Paricha Power plant is about 20 kms from Jhansi and is located on the National Highway (NH) 25. It has a spacious and comfortable guest house. After breakfast, we visited Power plant. This is the place where one of the chimneys had collapsed last August! Sitting in cities, we don’t realize what kind of meticulous planning and how much hard work goes in generating the power supply. Even though it is a small plant, it has about 12 Superintending Engineers and about 75 Executive Engineers. The township is located nearby plant in the other side of the NH 25. 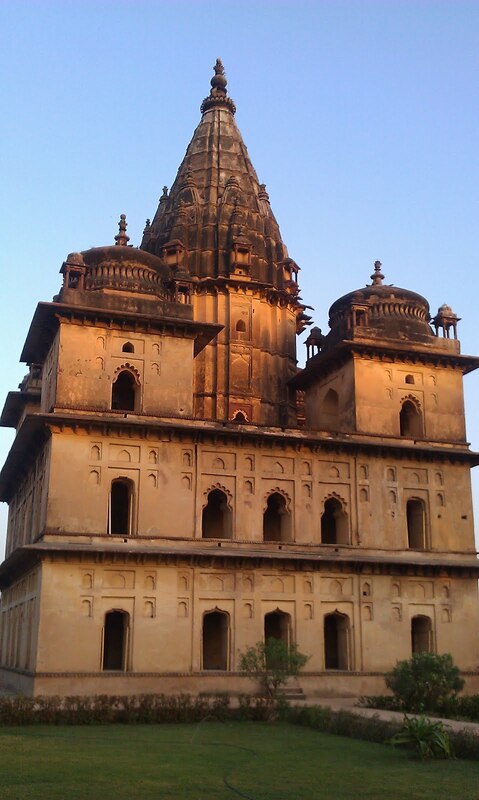 After a leisurely lunch, we headed for Orchha . It is located 18 Km. 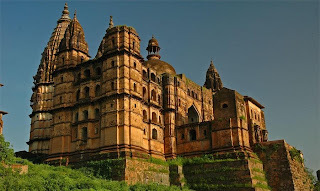 from Jhansi and is one of the most visited tourist places in Madhya Pradesh (MP). Orchha literally means a "hidden place" and is located in the Tikamgarh district of Madhya Pradesh and is on th e way to Khajuraho from Jhansi as one goes by road. The town lies on the banks of the tranquil River Betwa. And is surrounded by a tangle of a scrubby dhak forest. Orchha was founded in the 16th century by the Bundela Chieftain, Rudra Pratap Singh who made it as the capital of Bundelkhand. It is a small town dotted with historical monuments and the entire town can be covered on foot. There are number of resorts en-route as one is approaching Orchha, the famous one among them being Bundelkhand Resort. It was 4 pm by the time we reached Orchha and we first went to see the river Betwa. Even though there wasn’t much water at this point of the year, the flow was rapid and the water clear and one could actually see fish in slightly deeper pits as one stood on the bridge which is extremely narrow and connects to Orchha wildlife sanctuary and further to Tikamgarh from Orchha. It was a bit unnerving to walk through this bridge even as trucks and local buses passed through the bridge. The river overflows the bridge during monsoon and it must be some sight! 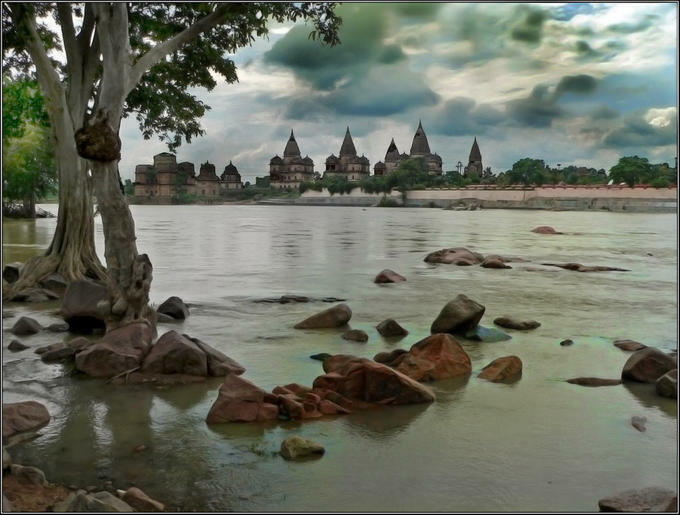 One gets an imposing view of the Cenotaphs as one stands on the bridge and looks towards Orchha and we were naturally drawn towards them. A cenotaph is an "empty tomb" or a monument erected in honour of a person or group of people whose remains are elsewhere. It can also be the initial tomb for a person who has since been interred elsewhere. The word derives from the Greek κενοτάφιον = kenotaphion (kenos, one meaning being "empty", and taphos, "tomb"). Chhatris are elevated, dome-shaped pavilions used as funerary sites in India which have such structures built over them. The most famous chhatris in India include Humayun's Tomb in Delhi and the Taj Mahal in Agra. Chhatris are the perfect examples of amalgamation of basic elements of Hindu and Mu ghal architecture. The term "chhatri" means umbrella or canopy. 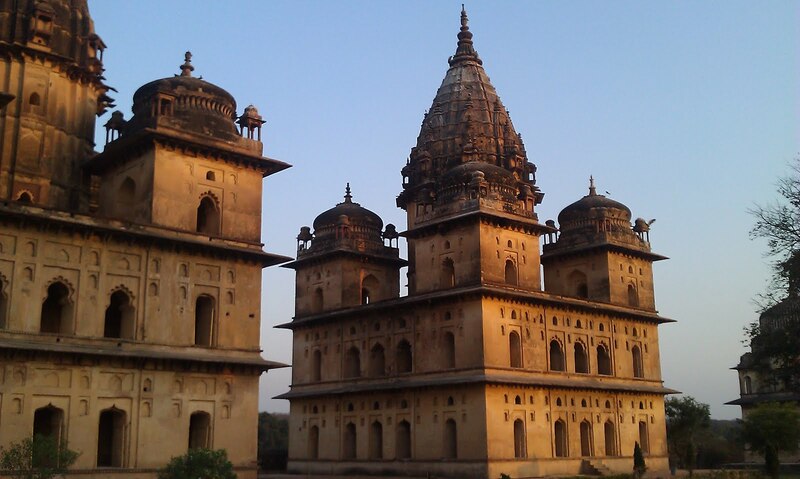 However, the tradition of constructing chhatris (cenotaphs) in the memory of late rulers and noblemen on the sights they were cremated, in such large numbers in such a small town is something peculiar to Orchha. There are a total of 14 chattris in Orcha. The main structure of the chhatris is designed to serve as a site for the Shraddha ceremony and apart from the central mausoleum there is also a secondary structure which is the fu nerary mound. There are a series of these cenotaphs along the river bank, all dating back to 16th and 17th ce ntury. Except for Bir Singh Deo's cenotaph which is in the shape of a palace, all other ceno­taphs are in the form of temples. A very interesting and striking feature of these cenotaph is that while the central shikhara at the top is in the typical Hindu style of Nagara architecture (NAGARA style temples have curvilinear towers as against DRAVIDIAN temples which have truncated pyramids), the four surrounding domes are examples of pre-dominantly muslim architecture. On the domes atop some of the cenotaphs one can see vultures nesting, which for most city dwellers has become a rare sight. It was almost dark by the time, we saw most of these cenotaphs and we decided to walk down to Ramraja temple for the evening prayers which takes place at 8 pm every evening (and also at 8 am every morning). 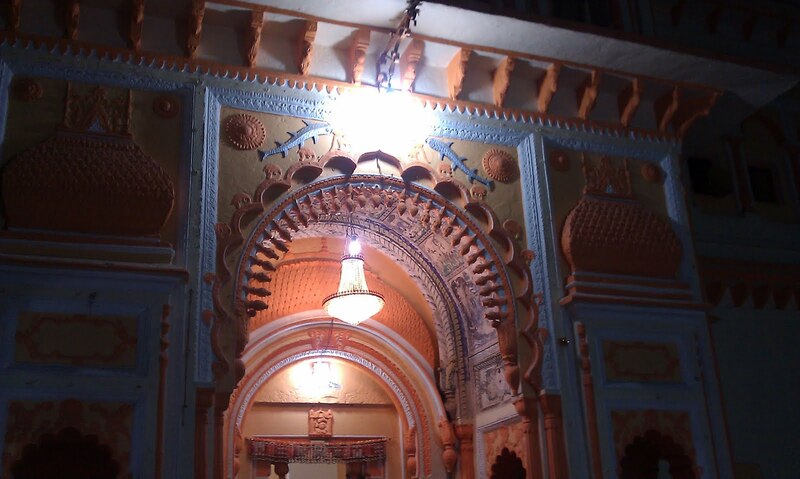 This palace turned temple has an extremely charming legend attached to it. The King Madhukar Shah was a worshipper of Lord Krishna while his wife the queen Ganesh Kuanwari was a devotee of Lord Rama. The story goes that the conflict finally ended when the chief priest advised both to worship their individual choice of God. The queen asked the King to build Chaturbhuj Temple in Lord Rama’s honor and the temple was planned in such a manner that the queen could see Lord from her Palace’s window. Following the dream visitation of Lord Rama, the qu een brought the statue of Lord Rama from Ayodhya to Orchha. The image was placed in the palace prior to its installation in the Chaturbhuj temple which was still under construction. However, later, the idols proved impossible to move to the new temple as they could not be lifted from its present installation. Later, the queen recalled deity’s one of the edicts that the image would remain in the place where it was first installed, the other being that the Lord would be the King where installed and that no other king could stay there (there are all folklores we heard while we waited for the evening puja to begin). It is for this reason it’s said that the king later shifted to Tikamgarh. This temple is perhaps the only place in the country where Lord Rama is revered as a king. I was intrigued and amazed that Lord Rama is accor ded the guard of honor before puja every evening and morning. Unlike other places, in Ram Raja temple the statue of Ramchandra, Sita & Laxman are in black stone. We witnessed the evening guard of honor. Puja aarti lasts for half an hour and it turned out to be a divine experience. This is the temple built originally to house Lord Rama. This te mple is dedicated to Lord Vishnu's four armed reincarnation (Chaturbhuj). The temple plan is a combination of temple and palace architecture. The temple rises in a huge stone pedestal fifteen feet high. The sanctum is star-shaped. The central part of the temple rises to four storeys with three arched opening in each storey except the third.which has false arched niches. It has the facade of the usual Bundela palace. One can see the Rama Raja Temple, Nau Chowk (the courtyard surrounded by nine palaces) as well as the Sawan-Bhadon (wind catchers). Adjacent to Ramraja Temple lies a central row of fountains which culminate in an eight pillared pavilion. 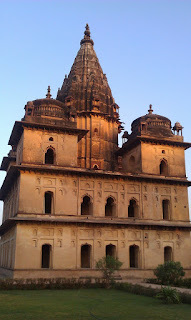 A subterranean structure below was the cool summer retreat of the Orchha Kings.The Thakhana was kept cooled by a cleverly constructed Persian cooling u nit. 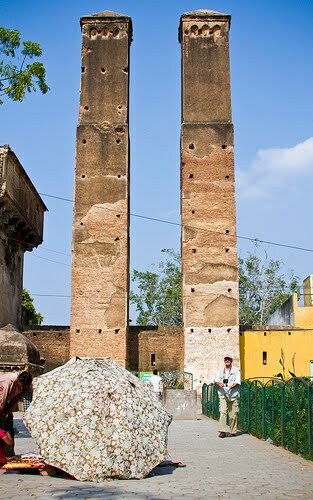 This unit was made up of two towers or dastagirs (two adjoining wind-catching towers )called the Sawan Bhadon pillars built close by. The towers were perforated on the top such that they could catch the wind, while the lower part of the towers was connected to a reservoir of water. The towers, the water distribution system (aqueducts), and the underground reservoir of water were ingeniously connected to a Chandan Katora or fountain in the pavilion above the retreat. The water from the underground reservoir was pushed up into the Chandan Katora and fell like a fountain onto the roof of the retreat thus keeping the Thakhana very cool. They are perhaps the only example of the Persian system of cooling in India. It was 9.30pm by the time we finished visiting these places and we drove to Bundelkhand Resorts and had dinner in the garden restaurant. 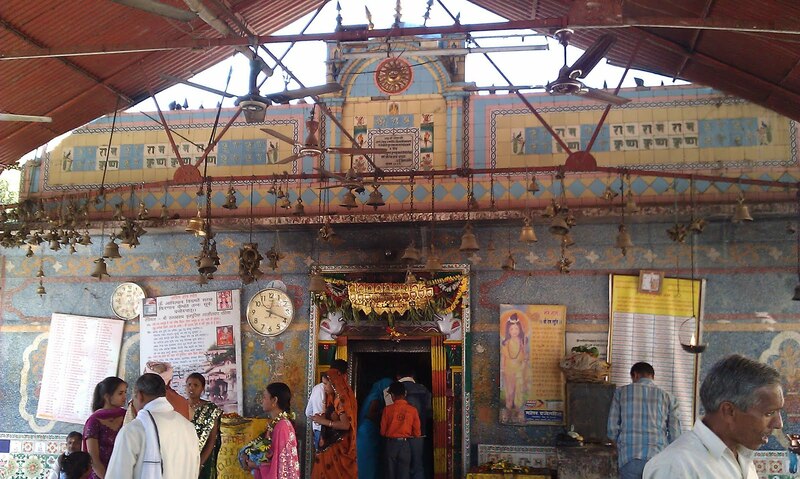 On Sunday, we went to visit Pitambar Peeth in Datia and Balaji Temple in Unnao. Shri Peetambra Peetha is a complex of Hindu temples (including an Ashram),located in the city of Datia, in the Madhaya Pradesh state of the central India. It was, according to many legends 'Tapasthali' (place of meditation) of many mythological as well as real life people. The shivlingam of shree Vankhandeswar Shiva is tested and approved by the Archeological Survey of India to be of the same age as that of the Mahabharata. It is primarily a Shakta place of worship (devoted to Mother Goddess). Shri Peetambara Peetha is one of the most famous Shakti Peetha of Baglamukhi which was established by in 1920s. 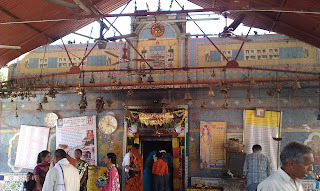 A temple of goddess Dhumavati also is there within the ashram. Dhumavati and Baglamukhi are the two of the ten Mahavidyas. In addition to those, there are temples of Parshuram, Hanuman, Kal Bhairav and other god and goddess spread across the large area of Ashram. I was really intrigued reading the notice boards in the temple premise saying that “saubhagyavati striyon ka pravesh nishedh” (married women are not allowed to visit Goddess Dhumavati). And we asked the local priest there. We were informed that Dhumavati ("vidhava Devi") is the Goddess of mortality, death and everything that is inauspicious. Her companion is the crow, a carrion eater. She wears clothes taken from a corpse in the shmashan (cremation ground), and she carries a winnowing basket. In the image above, she also carries a flaming kapala (bowl made of human skull), which represents detachment from egoic pursuits. 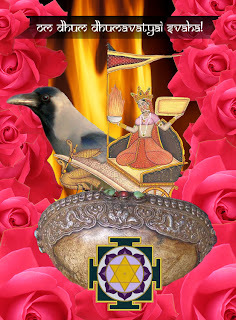 Dhumavati’s name means “Emanating Smoke” or “Full of Smoke,” referring to the smoke and vapors of the cremation grounds, as well as her maya (illusion). The truly fearless devotee through sadhana is able to move through her maya into truly clear vision. Beyond this illusion is the promise of immortality, of liberation (moksha). Dhumavati grants the power to overcome seemingly insurmountable obstacles, such as the fear of death itself, which binds us to our physical bodies. The goddess is very kind to her devotees and those who seek her blessings and protects them from all that's evil as per the folklore. The ‘prasadam’ offered to Goddess Dhumavati is salty namkeen! The goddess is supposed to the older sister of Goddess Lakhsmi and supposedly takes the form of Goddess Lakhsmi on Saturdays. We later went to Unao to visit Balaji temple. The Balaji temple is situated on the banks of river ‘Pahuj’ in Unao. Unao is a small town falls under Datia district in Madhya Pradesh. Unao is 17 kilometers away from Datia and around 18 kilometers from Jhansi. The deity Balaji is very much famous for curing skin ailments. People from far distant places come and worship the deity. It is said that, if one bathes in the river and offers water to deity Balaji, all incurable skin ailments get cured within few days. Sunday is considered as the day of deity Balaji (Sun). It was a coincidence that we visited on Sunday. Even though we didn’t take bath in Pahuj, we did touch the water and offered some to the deity. I also felt that the temple maintenance should improve as all the inhabitants of Unao and the surrounding region have enormous faith in the deity and the rural folks from far flung areas do visit the Temple on a regular basis. We came back to Paricha, had late lunch and took Shatabdi from Jhansi at 18.00 hours. We reached Delhi on 23.00 hours. It turned out to be a memorable weekend getaway. And somewhere it's a tremendous feel good factor that we are endowed with such rich heritage and culture. It's just that we need to preserve and maintain them and pass on the heritage to coming generations too. I was surprised that there's not much documentation of the folklore and we need to make serious efforts in documenting and inventorizing our heritage. It's Attractive post and also image. I liked it. Nice piece of travelogue. Pics made it very illustrative and live.....Let trend be continued. the wind tower concept was fabulously done and described...thanks! 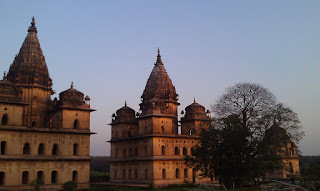 Hi..Thanks for writing about Orchha, seems like a great tourist place to explore near Jhansi. 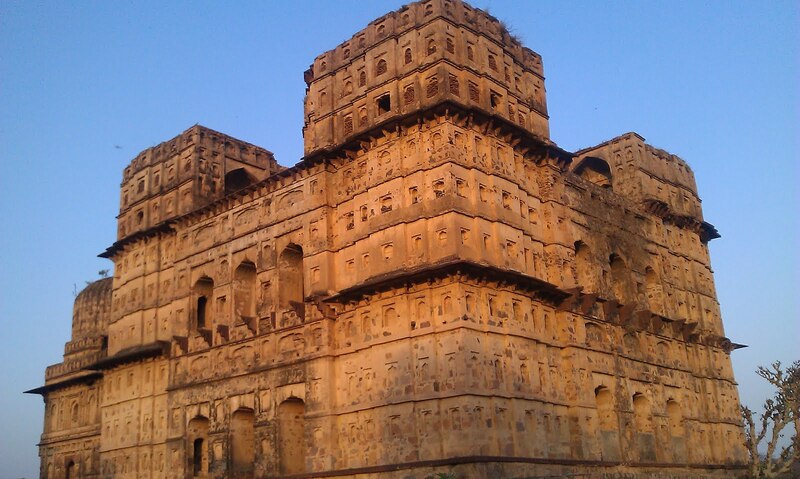 However, Jhansi in itself is a great city, it is well connected and nothing less than a treat for the history buffs. 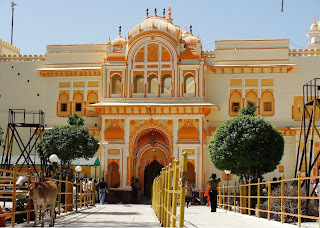 Click here to know about various places to visit in Jhansi. Golden triangle tour 6 days for this tour is really nice, All the places are very historical. The historical center inside the post has models that give an unmistakable perspective of the historical backdrop of Bundelkhand.